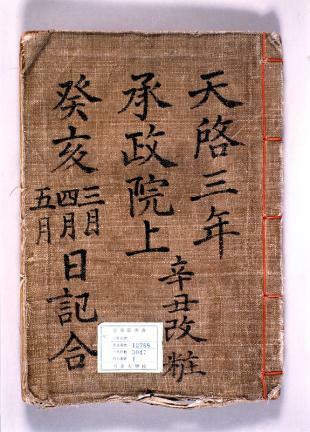 조선시대 국왕의 비서 기관인 승정원(承政院)에서 왕명의 출납, 각종 행정 사무와 의례(儀禮) 등에 관해 기록한 일기이다. 『승정원일기』는 편년체로 기록하였으며, 1개월분의 일기를 1책으로 만들었는데 분량이 많은 경우에는 2책으로 나누어 장정하기도 했다. 『승정원일기』는 조선 초기 세종대부터 작성되었으나 조선전기의 일기는 임진왜란, 이괄의 난 등을 거치면서 소실되었고, 현재는 1623년(인조 1) 3월부터 1910년(융희 4) 8월까지 288년간의 일기만 전해지고 있다. 조선후기에도 궁궐 화재로 인해 『승정원일기』가 소실된 경우들이 있었는데, 그때마다 『조보(朝報)』·『춘방일기(春坊日記)』·『일성록』 등을 참고하여 보완하였다. 『승정원일기』의 작성은 승정원의 정7품 관원인 주서(注書)가 담당하였다. 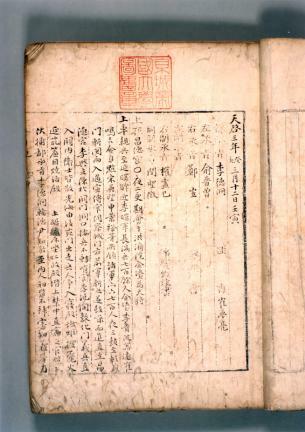 주서는 원래 2명이었다가 기록할 국정 업무가 늘어나면서 가주서(假注書) 1명이 추가되었고, 또 임진왜란 때에는 전쟁 관련 기록을 전담하는 사변가주서(事變假注書) 1명이 더 추가되었다. 그 결과 조선후기에는 2명의 주서와 2명의 가주서가 『승정원일기』의 작성을 담당했다. 일기 작성 과정은, 먼저 주서들은 국왕을 수행하면서 국정 운영 내용을 속기한 ‘초책(草冊)'을 작성한 다음, 이를 바탕으로 매일의 일기를 정리하였다. 정리된 일기는 승정원의 서리가 정서하였으며 1개월분의 일기가 모이면 책으로 묶어 승지(承旨)에게 보고했다. 그리고 승지가 이를 다시 국왕에게 올려 재가를 받음으로써 일기가 최종 완성되었다. 『승정원일기』는 총 3,243책 중 서명이 ‘승정원일기’인 것이 3,045책이고 나머지 198책은 ‘승선원일기’, ‘궁내부일기’, ‘전비서감일기’, ‘비서원일기’, ‘후비서감일기’, ‘규장각일기’ 등으로 서명이 다르게 되어 있다. 이는 갑오개혁 이후 승정원의 명칭이 ‘승선원’, ‘궁내부’, ‘비서감’, ‘비서원’ 등으로 자주 바뀌었기 때문에 나타난 현상이다. 『승정원일기』는 국왕의 비서실에서 작성한 자료인 만큼 국왕의 동정과 관련된 내용들이 매우 자세하다. 특히 국왕과 신하들의 국정 논의 내용, 국왕에게 올린 상소문 내용 등이 축약 없이 그대로 수록되어 있어서 실록 편찬의 기본 자료로 사용되었으며, 현재도 조선후기사 연구에 있어 1차 사료로서 그 가치를 인정받고 있다. 2001년 9월에 유네스코 세계기록유산으로 등재되었다. 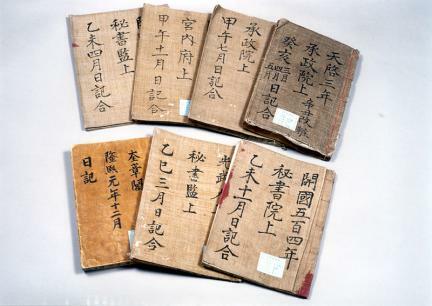 These are daily journals written in Seungjeongwon (Office of Chief Secretary to a King in charge of royal commands), recording all the incoming and outgoing royal documents on various issues. 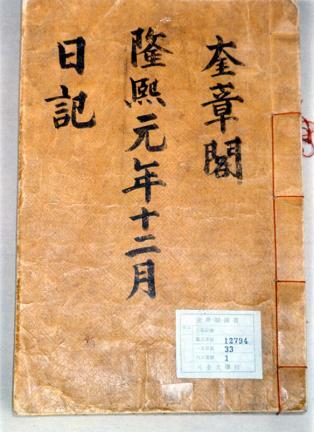 These journals were written by 6 Secretaries of Upper 3rd Level and 2 Clerks of upper 7th Level; A Chief Secretary was in charge of documents of the Ministry of Personnel Affairs; a First Deputy Secretary, the Ministry of Defense; a Second Deputy Secretary, the Ministry of Finance; a First Assistant Secretary, the Ministry of Culture; a Second Assistant Secretary, the Ministry of Industry and a Third Assistant Secretary was responsible for the documents of Ministry of Justice. 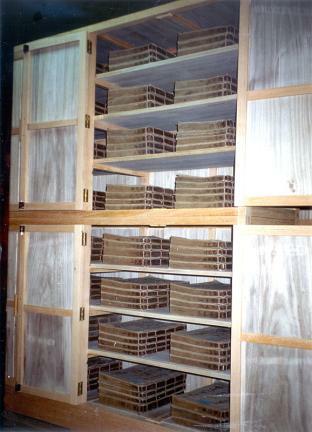 Clerks put the documents in record, in which temporary clerks filled in when the clerks were not available. Special documents on war situation were recorded by a temporary clerk for national emergencies. The journals continued from April 12th, 1623 to August 29th, 1910 for over 280 years, undergoing the changes in the name of supervising office and even the title of the journals in the course of the time. These journals consist of a total of 3243 volumes, with 393578 parts, chronologically listed; typically, records for a month made up a volume, though some months had two volumes depending on the amount of records. 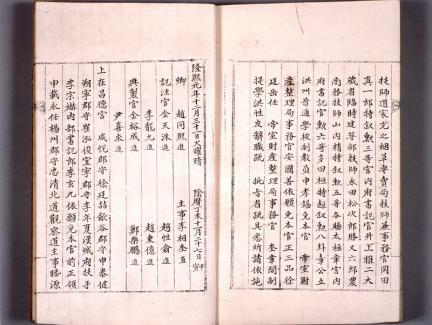 The journals had served as the primary source to historiographers working on Joseon wangjo sillok (The Annals of Joseon Dynasty), and they have been highly praised for a thorough recording of the entire picture of Seungjeongwon, a pivotal office in a royal court, taking care of not only important national events but also simple routines as well.